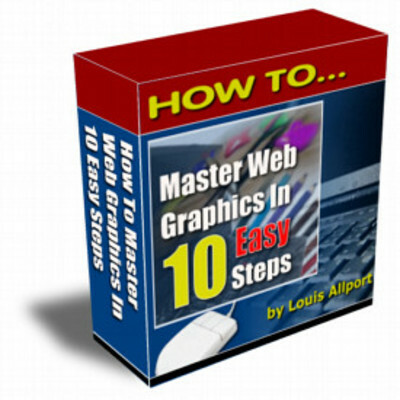 "Discover The 10 Quick & Easy Steps To Becoming A Web Graphics Whiz Even If You Can't Currently Tell A Pixel From A Bitmap..."
If you're creating your own web sites, selling on eBay, creating ebooks, or even just sharing private photos online with your family, chances are you're working with graphics. You know what I'm referring to when I say graphics, right? Not text - like this - but a graphic (like the header at the top of this page). Graphics online come in all shapes, sizes and colors ... they're as much part of the web as the alphabet! I've put together for you ten very quick and easy steps that are guaranteed to make you very confident working with web graphics of all shapes and sizes. You'll be able to create your web sites quicker, make them look even better, help to sell more of whatever you're selling online, create even better looking eBay auctions ... even perhaps rent out your graphics services for a fee! * Which is the best type of graphic to have on your web site - a Bitmap, a Jpeg, or a Gif? * Which graphic format is the highest quality? * How do you make your web graphics quicker to load? * What's the easiest way to take "screen grabs"? * Why would you want to "crop" your graphics? * Why could the number of colors a graphic has be a problem? This product comes in the form of eleven very detailed and in depth coaching videos coming to a total of ninety-eight minutes. In this video I'll reveal where to download one of the most powerful and 100 free image editors available. The three main graphic formats, how to convert between them, and why choosing the right graphic format can boost your online sales. In this video I'll show you how, why and when to "crop" your graphics to make them look even better than they already do! Here I'll show you how to rotate and flip your graphics just like I've done with the graphic on the left. In this video I'll show you the easy way to make your graphics bigger or smaller whenever you want. This is the same powerful tactic I've used with these video screen grabs to make them fit nicely on this page. Here I talk you through why the "color count" of your graphics is so important, and how and why to higher or lower your color count from time to time. In this video I'll show you how to quickly and easily apply amazing effects to your graphics to help you stand out even more on the internet. Here I'll show you probably the easiest way to take "screen grabs" (also known as "screen shots") of what's happening on your screen ... if you create any kind of tutorials, sales pages, or ebooks you'll find this technique incredibly useful and surprisingly easy. In this video I'll show you a very easy way to add text to your graphics so you can have captions wherever you like. Here I'll show you a real time saver - how to do batch editing and batch conversions to graphics. I'll talk you through exactly how I automatically convert thirty graphics from one format to another with just the click of a button. In this video I'll show you how to apply some great color effects to your graphics.